Meet the forecast for the coming weekend. The weekend when I’ll be outside on a bicycle all day Saturday and Sunday for the Cycling Savvy Instructor training. Gulp! As if being 34 weeks pregnant weren’t enough, let’s throw some scorching temps into the mix. I’m trying to think positive thoughts, and I will be listening to my body and taking breaks as necessary, but I’m feeling a bit anxious about the whole thing. I would totally be up for an unexpected cold front sweeping through between now and Saturday. This entry was posted in Biking and tagged biking while pregnant, pregnancy. Bookmark the permalink. Yikes! Your lows are higher than our highs! Too late. 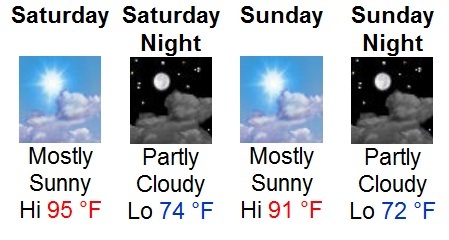 The blast furnace turned on today – it was nearly 100.
i like your site, stl can get very humid!